I think it’s safe to say that lydia has made herself at home. every afternoon, she meows at our window, daintily trots in (it's a smug trot, too.) 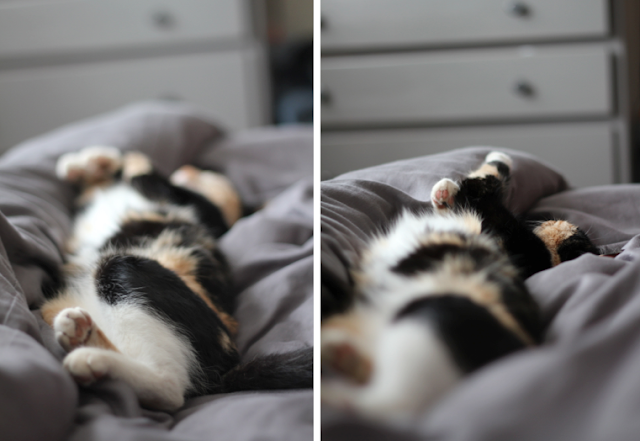 and plops her merry self down on the bed. then she’s out. like, I can yell and move my feet and she’s is just out. just comfy, sleeping on her back with her little paws up in the air, fluffy pink belly exposed. if that’s not a sign of trust, I don’t know what is. p.p.s. lydia's dead mouse count is up to four. and I still freak out when I see it happen. you'd think I would be proud / over it / not a total pansy. go forth, lydia in protecting our backyard from the evil that is the city mouse. Miss Lydia is adorable! I can't wait to meet her. And can you please post watch photos, already?! Your Kate Spade tissue teaser is unsatisfying. Sleeping cuddly cats make such cozy pictures.